Following the development at the Senate where Franklin Drilon was replaced by fellow Liberal Party member Ralph Recto, where Bum Aquino got replaced by Francis Escudero and Risa Hontevirus was replaced by Tito Sotto there's a new relocation of tasks. It is said that Bum himself will probably be made head of the Respect For Geeks Committee. But one committee has been made open by President Rodrigo Duterte. "Investigations on whether or not Leni was wrongfully announced as vice-president is still going on. I don't think she schemed to become Vice President. But if she's ever wrongfully installed I have prepared a new position for her. I call it the Lugaw Committee." said President Duterte in an interview. After the Leni Lugaw campaign, people complemented the dish for being the best lugaw ever served. As a result, President Duterte decided it would be a waste to throw away such good lugaw. Instead, he decided that Robredo can stay relevant if she were the head of the Lugaw Committee and that it would be good for tourism. 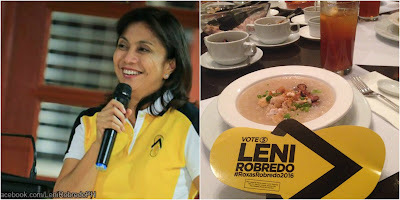 "If ever Leni has to be unseated, she will still be relevant by heading the Lugaw Committee. Me and Japanese Prime Minister Shinzo Abe tasted it and both loved it. A lot of the foreign dignitaries I met called it the best lugaw they've ever tasted. So that's why I plan to locate Leni Robredo as head of the Lugaw Committee if she was ever installed by mistake." said President Duterte. This comment angered Loida Nicolas-Lewis who said, "Who is Duterte to give Leni that position? No, he must resign and make Leni Vice President and Kris Aquino as her vice president." But her pleas fell on deaf ears.